A lovely well grown filly by Strategic out of Future Plans is certainly creating plenty of interest by all that see her when visiting the Trotter Stables. Sophia is her stable name and she just happens to be a half sister to sentimental stable favourite Kaitoa who unfortunately never fulfilled his potential succombing to illness and passing away. 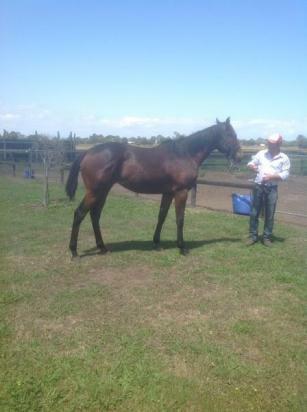 She is a lovely leggy filly with a good hind quarter and shoulder. Expecting her to have plenty of size. Future Plans has proven than she can throw winners and Strategic is by far and away the best stallion she has visited. This filly looks like she will be fully sold by Christmas given the level of interest shown in her and with Strategic mares starting to feature in the broodmare results a filly with plenty of residual value down the track as well.